MP3 and EPUB versions of Dr. Kweethai's book; Hypnotherapy, An Alternative Path to Health and Happiness, are missing a couple figures that appear in the hard copy. So they are posted here. The first figure is in Chapter 3. It shows the spectrum of human consciousness as Dr. Kweethai imagines it. She took the liberty of extrapolating typical EEG patterns into a continuum from wakeful, conscious awareness to comatose unconsciousness. The model is arbitrary but it helps in visualizing how trance works. Imagine consciousness as the capacity to experience and process sensory information from within your environment. 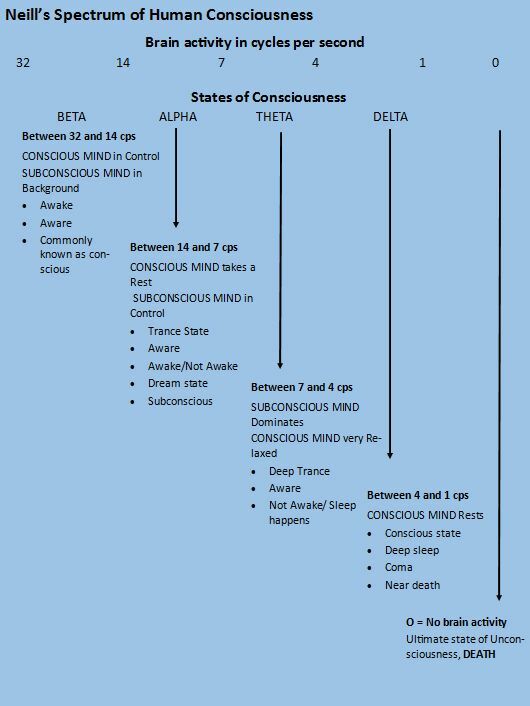 It’s easy to presume this to be a dichotomous variable, where awake = conscious and asleep = unconscious. But, the context of a continuum of awareness suggests that you are more or less aware of sensory input at any given time. Responding to an alarm clock suggests that you are receptive to sensory input while asleep; and therefore conscious, though not very. So, asleep ≠ unconscious unless the sleep is deep enough that you respond to no sensory stimuli at all (i.e., can’t be awakened; unconscious). In other words, we receive sensory input and process information whether we are physically awake or not. The continuum of awareness depicts consciousness mainly as a contrast between the conscious and subconscious minds. Taken to extremes it goes from fully awake to comatose and even dead (the ultimate unconscious state); with wakefulness represented by a measure of brain activity in cycles per second (cps). However, that contrast means that at any point along the continuum the interaction of the conscious and subconscious minds varies. At a higher cps the conscious mind predominates, but the subconscious mind still has an influence on information processing and decision-making. At a lower cps the subconscious mind predominates. The relevance of that predominance becomes apparent when you understand that the conscious and subconscious minds are responsible for different types of information processing. The conscious mind is oriented toward cognitive processing. It deals mostly with objective facts and data. In contrast, the subconscious mind is oriented toward affective (social/relational) processing. It deals with subjective emotions and feelings. Therefore, your state of wakefulness determines to some extent whether you respond to sensory input logically or emotionally. When awake, brain activity registers in the range of 14-32 cps (beta state). That means the conscious mind is largely in control, with the subconscious mind playing a smaller role. As you relax, the brain slows to 7-14 cps (alpha state); the subconscious mind takes over, allowing the conscious mind to rest a bit. This is the state at which hypnotic trance engages. You are awake and aware, inasmuch as you continue communicating with the hypnotherapist, but this state opens the subconscious for processing; accessing past events and receiving new suggestions. Deeper relaxation can slow brain activity to 4-7 cps (theta state) for deep trance. Because the subconscious mind is so much more open, and because the conscious mind is inhibited in a way that it can no longer interfere with re-scripting, according to some hypnotherapists deep trance work is often the most effective at resolving long-standing issues. Slowing further than four cps puts the brain into a state of unconsciousness. The conscious mind takes a complete break. Consider it a very deep sleep. However, in circumstances of illness, drug use or trauma, when the brain is unnaturally slowed towards zero, coma can set in. At this very low level of brain activity the conscious mind is inactive, but there is evidence that the subconscious mind remains active. Even conventional doctors encourage loved ones to continue talking to patients who have lapsed into a comatose state. The patient cannot respond cognitively but is likely receptive to feelings and emotions expressed through the continued attempts to communicate with them. And, of course, there are numerous stories of people who, upon awaking from a coma, relate clear memories of what they heard around them. The continuum of awareness represents the capacity for experiencing sensory input whether you are aware, awake or even unconscious. The proportional roles of the conscious mind and subconscious mind determine how you respond to that input. The relevance to hypnotherapy is that the subconscious mind is where experiences are reframed, which redirects the conscious mind to new patterns of thought and behavior; a path toward better health and happiness. The other Figure appears near the end of Chapter 6. Anger not expressed in a peaceful way begins to accumulate in the body. If you get angry frequently, it begins to feel like you are walking on egg shells most of the time. And, if you do not have the skills to express anger appropriately, it will recur. Frequent recurrence brings on a state of anxiety, causing you to feel tenuous and stressed. Living in constant fear, feeling you are not good enough, eventually produces a state of anxiety. You begin to worry that at any time someone will have an opportunity to judge that you are not good enough. This makes you feel like a failure or loser; simply incapable; regardless of your actual abilities or achievements. If this feeling of anxiety is present more days than not, you become frozen in fear most of the time. 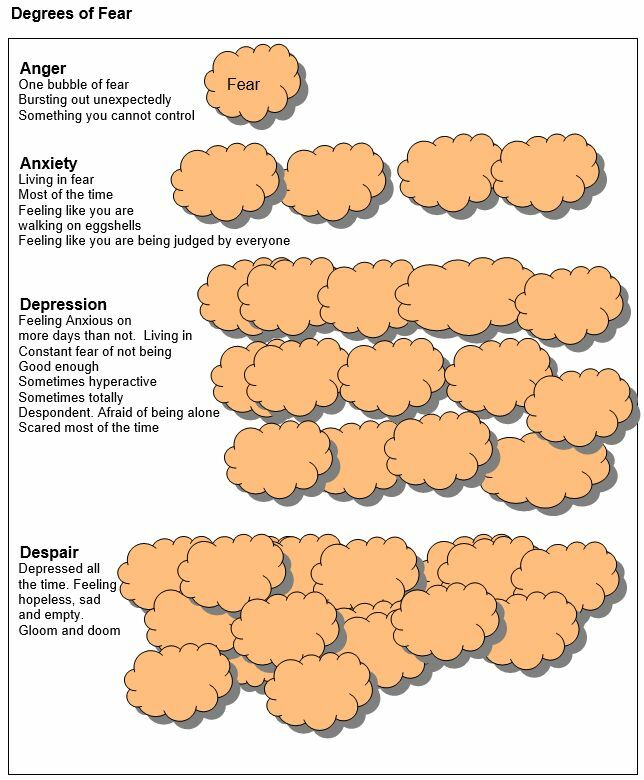 Thus compounding fear in anxiety, depression occurs and suffering increases. At its worst, you become so governed by fear that you lose motivation to do anything; giving in to the temptation to stay in bed and hide under the blankets. But, that’s not the only expression of depression. For others, the fear of not being good enough causes you to strive unceasingly for perfection. You get very busy doing “things;” working long hours, talking all the time; afraid to stop and be alone. You become a perfectionist workaholic. Of course, you derive enjoyment from telling others how busy you are. It makes you feel important or accepted. But, at the same time you are not happy. At either extreme, even depression takes time off. There are occasional days when you feel good about yourself; not many, but once in a while. Those are the days when you realize what you are missing out on in life. It’s important to note here that anxiety and depression are clinical psychological diagnoses. The current discussion relates to them simply as emotional states. As an emotional state, depression is not a persistent condition; some days are better than others. However, if there is no respite from depression; if it becomes an everyday experience; it leads to a feeling of hopelessness. When eventually even hope is absent, you fall into despair. Despair is the most intense and desperate form of human suffering. But, it creeps up on you so gradually; you may not realize it until you’re there. “How many of you have been bitten by an elephant?” No hands go up. “How many have been bitten by a dog?” A few hands go up. “How many of you have been stung by a bee?” Several more hands go up. “How many of you have been stung by a mosquito?” All the hands go up. While interviewing clients, I draw a chart similar to the Figure as I explain how fear works in most people’s lives. I then ask them to reflect on the level of fear in which they live. Most clients easily point out the level they are at. I give them a colored pen and ask them to mark that spot and I date it. After a few sessions we revisit the chart. Clients are happy to see that, after their energies have been transmuted from fear into love, they find themselves at a higher level from where they began. Often they are off the chart and happily declare they are not scared anymore. Hypnotherapy taps into your fears and changes them into love. As you become able to love, accept, and nurture yourself you experience healing based on that transformation. It is a metamorphosis.